Why is the Bridge to Tomorrow Better than other Lower Cost Procedures? Why is the Bridge to Tomorrow Better than other Lower Cost Procedures? Home › Fix My Smile › Why is the Bridge to Tomorrow Better than other Lower Cost Procedures? There has never been a better time than the present to receive dental care in the U.S. With so many remarkable advancements being made in the field of restorative dentistry, patients have never had so many affordable treatment options available to repair or replace their missing or failing teeth. However, while there are plenty of lower cost procedures out there, there’s often a significant tradeoff to be had in terms of longevity and quality. Cheap, “quick fix” solutions are often ineffective in treating a serious dental issue like a mouthful of missing or failing teeth. Often, these lower cost procedures are prone to failure shortly after they’re completed – cheap dentures and dental bridges are the most commonly prescribed and are also the most likely to break down and need repair. The money you could potentially save in the short term by choosing these procedures will be washed out by the money spent on costly additional dental work in the future. You don’t need to compromise on quality any longer, the Teeth Tomorrow® Bridge to Tomorrow™ can get you the results you need, within your budget! 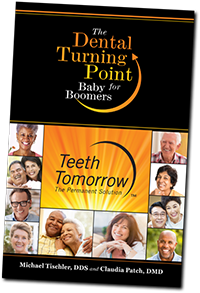 Unlike the other lower cost procedures, Bridge to Tomorrow™ is designed to offer you a stable, affordable solution to your missing or failing teeth. Delivered using the same tested and effective Teeth Tomorrow® procedure that has produced an over 99% success rate among over 2000 cases, your Bridge to Tomorrow™ dental implants are guaranteed to last. While a common set of dentures or an acrylic dental bridge will require hours and hours of painful chair time to fix or replace, your Bridge to Tomorrow™ is easily placed and requires no further repairs or adjustments! Even better, your new dental implants can not only hold your full set of upper and/or lower Bridge to Tomorrow™ teeth in the meantime, they can also easily hold an upgraded set of Prettau® Zirconia teeth in the future. Other lower cost procedures cannot offer you the peace of mind that comes from knowing that you can choose the option that best fits your immediate needs/budget, without compromising your future. It’s never been easier or more affordable to get the smile you deserve! Find out if Bridge to Tomorrow™ is the right choice for you – schedule your consultation today!